Coming home from a three and a half week long vacation, we were in for a surprise. At first sight everything looked as we left it. A closer look revealed a small glitch: the clock on the oven wasn’t working. We went to the meter cupboard and discovered that the GFI (or RDC) had tripped. We switched it ‘on’ again. This set off an unexpected, but alarming beep in the laundry room. Reluctantly, we opened the door to the laundry and saw an unusual winking symbol above the freezer door. The dark pool under it did not promise much good. I put on my gloves, got the largest plastic bag I could find and I opened the door. The putrid odor of dead animal almost knocked me over. Not giving in to feelings of resistance, I put everything in the bag, I put a knot in it tight enough to keep the smell in and the flies out and put it in the bin outside. Next, I put the drawers in the driveway, all the while being grateful that I had defrosted and completely cleaned my freezer in the week before we went away. As a result, our freezer had been almost empty; in it had only been a few breads, three small pieces of meat, ten ice cube bags with freshly made elderflower cordial and one with beetroot juice. We left the door of the freezer open and burned incense to prevent the dead animal smell from entering the rest of our home. I cleaned the freezer interior with a mixture of vinegar and baking soda, but it kept smelling. After half a week, I cleaned one drawer, bought a fridge fresh egg and put the freezer back on. It still smells like dead animal though. This pungent odor contaminates everything. 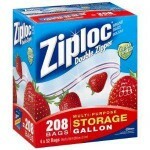 Fortunately, it seems the plastic bags take on the odor and the food inside stays fresh. On vacation, I was feeling somewhat frustrated with old habitual feelings taking over when I wasn’t paying particular attention. After the freezer incident, I realize that 40 years of conditioning leaves traces; the foul odor of the tales I was told by socializing voices and the lies I repeated to myself about being separated and unworthy are still lingering. Although I now know on the deepest level that I AM Perfection, this truth is the size of a mustard seed. It needs the right conditions and a lot of TLC to grow and florish, and for the moment, it needs protection from contamination. So this week, I’ve stocked up on spiritual freezer bags to keep my thoughts and feelings fresh. 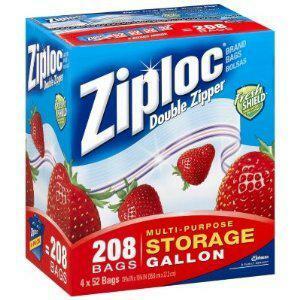 Not just any freezer bags, zipper bags, double zipper bags to be precise. The spiritual equivalent of the double zipper is the combined power of intention and attention. The intention being ‘having fresh thoughts and feelings’, the attention making sure they stay that way. Just as dead meat leaves a bad smell in the freezer, negative experiences leave traces in the brain. Fortunately, we can rewire our brains by choosing to strengthen ‘positive’ networks and ignore ‘negative’ networks. What you give attention to grows and what you ignore withers and dies at last. This is true for the brain, and it is my sincere hope for freezers too!